Mini Roadster review | What Car? The Mini Roadster is the new soft-top version of the recently launched Mini Coupe. Unlike the Mini Convertible, it's a strict two-seater; the first open-top Mini with this configuration. The German-spec car we drove had a manual roof, but a part-electric roof that can be raised or lowered in around 10 seconds will be standard in the UK. The model line-up mirrors that of the Coupe, with Cooper, Cooper S and John Cooper Works petrols and a Cooper SD diesel. What's it like to drive? The Cooper S is expected to be the best seller, and it was this that we tried. It's powered by the 181bhp 1.6-litre turbo engine that's used across the Mini range, and is a strong and punchy performer that's happy to pull from low revs. Press the Sport button (standard on the John Cooper Works and an option on other models) and things get even better because this makes the engine pop and bang addictively when you lift off the accelerator. 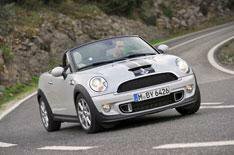 Like all Minis, the Roadster also has sharp steering that helps it dart into bends. However, it's not as accurate as the Coupe's, because some body rigidity has been lost with the solid roof, causing bumps to send shudders through the wheel. The fact that the Roadster has a firmer ride than the Mini Convertible and hatch doesn't help its composure on bumpy stretches of road, but the payoff is minimal body lean in corners. With the roof down there's a lot of bluster in the cabin, and when it's raised you can hear wind whipping around the sides of the car. What's it like inside? The dashboard is just like the Coupe's, so it has a funky, retro design, but is full of messily arranged and poorly marked switches. The materials are a bit of a mixed bag, too, but everything feels solidly assembled. Most people will have no trouble finding a comfortable driving position because there's bags of adjustment and enough head- and legroom to keep six-foot-plus occupants happy. As in the vast majority of soft-tops, over-the-shoulder vision is very limited with the roof up (although it's no worse than it is in the Mini Coupe). Even with the roof down, the rear view isn't great - blame the mesh wind deflector and the rear spoiler that automatically deploys above 50mph to aid stability. The manually-operated fabric roof folds neatly behind the seats, so the large - for a roadster - 240-litre boot is unaffected. As a bonus, the roof can be operated at speeds of up to 18mph, although it takes a bit of muscle to clip it to the top of the windscreen. Should I buy one? We can understand why you'd be tempted. The Roadster carries a premium of just over 1000 over Coupe models, which translates into a starting price of 18,015 for the regular Cooper. That means it costs about the same as its main rival, the 1.8-litre Mazda MX-5, but the Mini will be far more fuel-efficient and its resale values should be at least as strong. It's a similar story when you compare the Cooper S model that we drove with the 2.0-litre version of the MX-5, although here the Mini looks even more tempting because it's 590 cheaper and has an extra 23bhp. Just bear in mind that you'll probably have more fun driving the Mazda.